For decades, exotic animals from far-reaching corners of the globe have found their way to Southern California. My father has shared stories of growing up in El Monte, a once small-town located about 13 miles from downtown Los Angeles. Although El Monte has a population of over 120,000 today, in the 1930s and 40s, it was still rural and sparsely populated, offering lots of opportunities for a boy who loved adventure - real or fanciful. On warm summer nights, Dad told me, with the windows wide open, he would fall asleep listening the sound of the roaring lions who lived around the corner. Yes, lions. 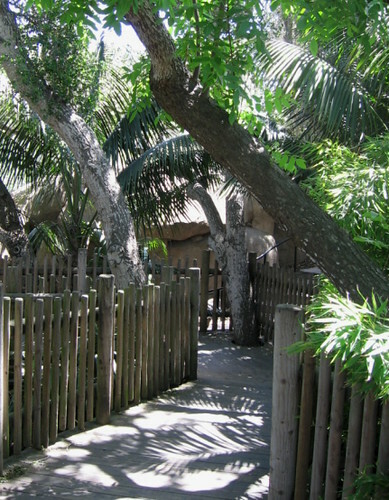 The lions made their home at Gay's Lion Farm. They were trained to perform in movies and for other entertainment-industry events. Near the Lion Farm there was an ostrich farm, and an alligator farm. And throughout the greater LA area, there were ranches and farms that were home to elephants, monkeys, tigers and other exotic animals. It was the perfect environment for a boy with a bold imagination. 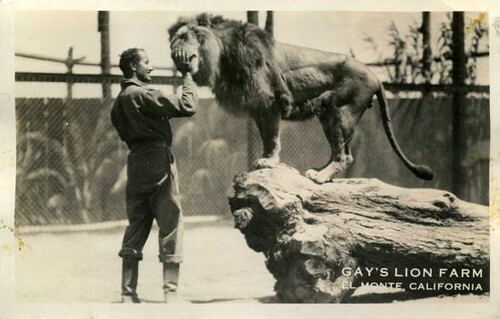 As early as the 1920s, the burgeoning movie industry began using exotic animals; and when they weren't sharing the silver screen with movie stars, the animals were at home in the warm and hospitable climate of Southern California. 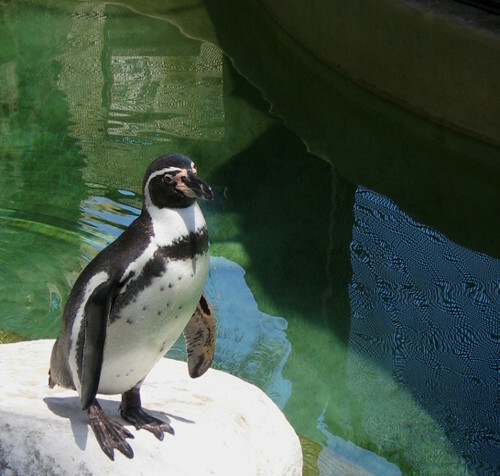 Today, most of our exotic animals are found in zoos. 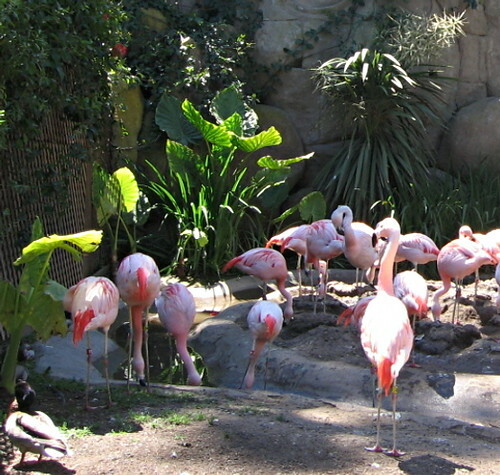 Here, in Santa Barbara, we are privileged to have the Santa Barbara Zoo, which opened in 1963. 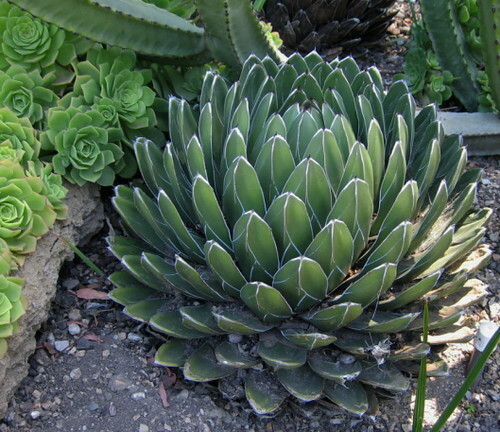 On this hot April afternoon, I thought it was a perfect day to wander among the animal exhibits and botanical beauty of the Santa Barbara Zoo. 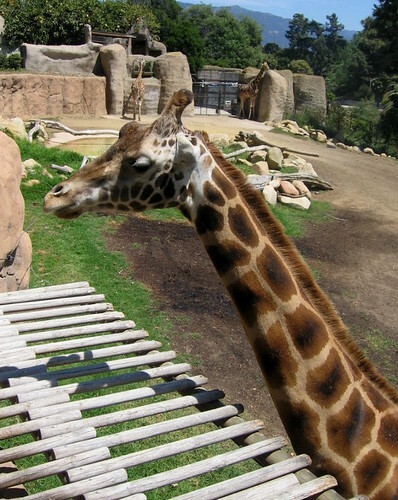 Located on a tract of land between Highway 101 and the Pacific Ocean, the zoo sits on a hill overlooking some of the most beautiful scenery in Santa Barbara. This 30-acre parcel of land was once the home to John Beale and his wife, Lillian, who built an incredible estate surrounded by lush gardens. There are still subtle reminders of that original home visible at the very top of the hill. 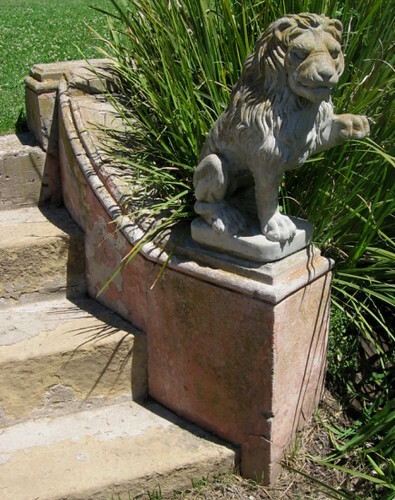 The home's original sandstone steps and guardian lions can be seen amid the yellow iris and emerald grass. From the top of the steps you can look out to see sailboats and windsurfers on the ocean, and on clear days, you can even see the Santa Barbara Channel Islands. When Mr. Beale passed away, Lillian married John Child. The property became known as the Childs' Estate. Mrs. Childs developed an affinity for the men who wandered the country on foot or by rail, and were known as hobos, or "knights of the road". She allowed them to reside on her land. With her blessing, these "knights" built a shanty town at the edge of her lagoon - which is known today as the Andree Clark Bird Refuge. The encampment was sited near the Southern Pacific Railroad trestle, making it easy for the "knights" to come and go via their preferred mode of transportation. Mrs. Childs even sent food to the camp every day, from her own kitchen. Although these men lived outside traditional society, they had an elected mayor, and rules for residents that were strictly enforced. No drinking, no drugs, no violence. 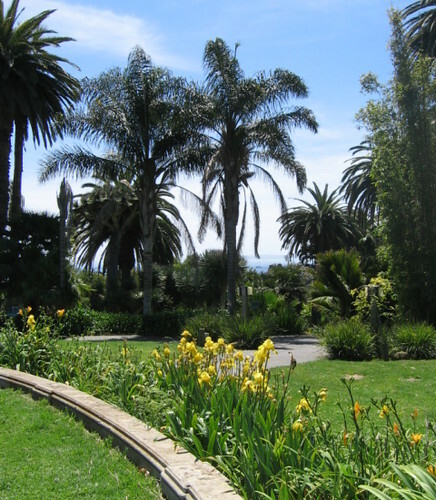 Upon her death, Mrs. Childs left her property to the City of Santa Barbara. The hobos were allowed to live out their natural lives in the homes they had created at the water's edge. 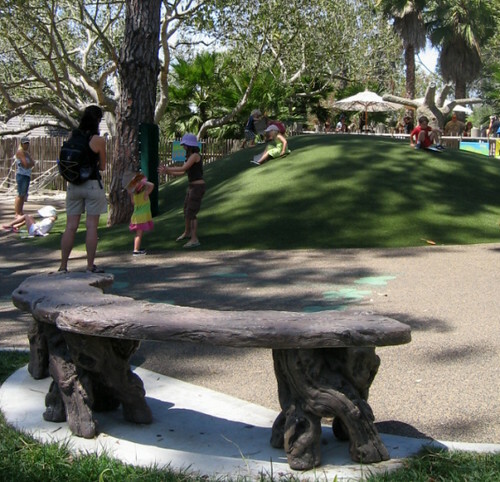 Eventually, in 1963, a group of local citizens brought a new dream to life on the property that sits above the lagoon: The Santa Barbara Zoo. 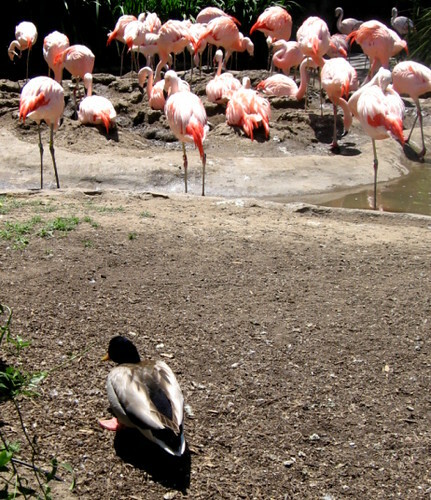 The Zoo is certainly not the biggest, nor fanciest zoo in California. It's just a beautiful little hometown zoo. There are big sweet elephants, and a trio of lanky giraffes. 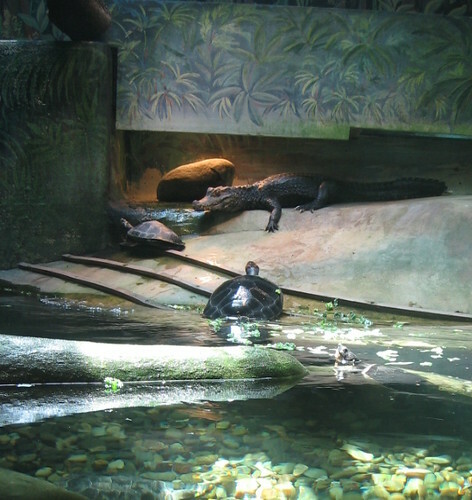 There are capybaras and gorillas, snow leopards and otters, and a young crocodile who shares his home with some turtles. There are snakes, monitor lizards, otters, goats, and a whole creepy exhibit of arachnids, hissing cockroaches, scorpions, and other stuff that I won't even look at. There's a new section, entitled "Trails of California", with exhibits for some of California's endangered natives: Channel Island foxes, bald eagles, and California Condors. 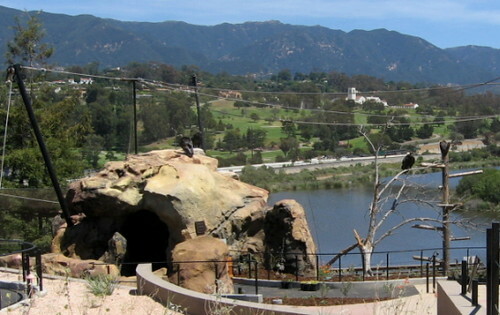 The condor exhibit doesn't open until this Saturday, April 25, 2009, so today, I could only watch them from a distance. Condors are huge and magnificent birds with a prehistoric mien, who soar in silence above the sandstone mountains and chaparral of Southern California. 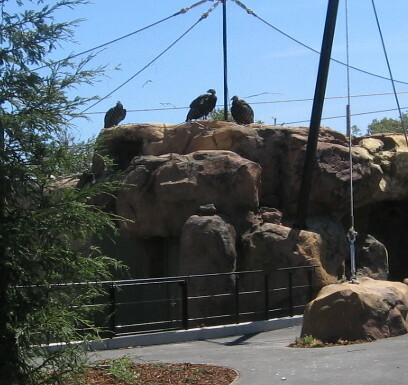 Although almost extinct in the wild, the condors' presence in the zoo will illuminate the plight of our local native species who are in peril. We will all learn more about how to ensure their survival. 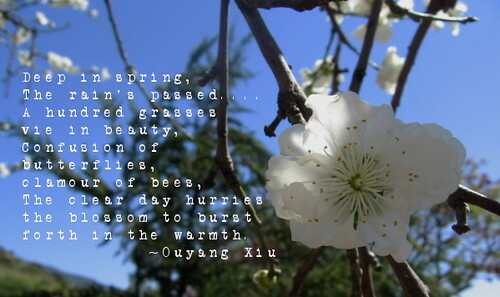 I love coming here alone, too, and walking the shadowed paths, with mysterious curves that wind among the giant-leaved monsteras and tall bamboo, and the forests of palms that shade rolling lawns. and ponds and waterfalls and the incredible views, north and south. Today, it was in the 90s, so lots of the animals were napping in shaded corners, or in their darkened caves, unruffled by the visitors and noise around them. 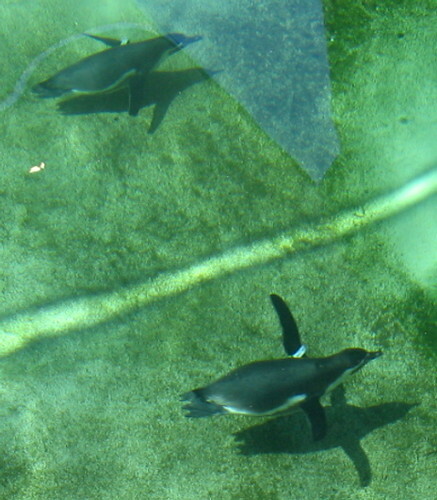 But in my favorite exhibit, the penguins were enjoying a cool respite from the heat. or from below the surface, in the dark little cavern where I can watch them through thick aquarium glass as they swim straight for the window, and turn at the last moment, with a sudden playful flip. They are a comic, chubby delight and I am thrilled to watch them. And I always laugh - I can't help but laugh. Most of all, I love the unexpected things that I find at the zoo - the wild sparrows that squeeze between the small wire openings in the aviary, volunteering to live in a safe little world of cool mist and wide-leaved tropical plants, among azure and purple and red birds from places like Japan, Malaysia and China. 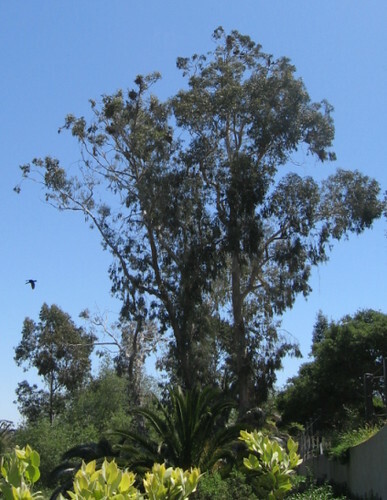 I love that a flock of big, black birds (double-crested coromorants, I think), have taken up residence in the tall eucalyptus trees behind the elephants' home. I watched as dozens of them flew in and out of the trees, busy and boisterous, carrying long, angular sticks, and strips of plants. I watched as they added more and more to their nests that were placed in the crooks of the branches high above the lagoon. I counted 14 nests in the trees - there may be more. It is a eucalyptus high-rise full of activity and noise - and preparations for the nesting season. I love that there is always some kind of drama. Today, there was a fight between three ring-tailed lemurs who screamed and swung from the branches and flailed their arms, and challenged each other with their wild eyes. 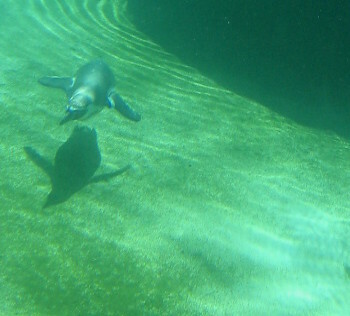 And the penguins were feeling frisky after their swim. For the first time in my life, I heard the mating call of penguins: an enormous and oft-repeated sound - a "gack" that was as loud as the horn of a 30-ton tanker ship at the Port of Long Beach. At first, there were two groups, puffing out their wings, calling each other out - their narrow heads swinging from side to side on their long necks. Soon, they erupted: black beaks clacking as they struck each other with their bills, a furious display of spindly-legged power, and the resulting fog of war - a pink cloud of plumage flung into the afternoon heat. And then, suddenly, it was over. They resumed mud-nibbling and grooming, while the mallard and I reeled, stunned at what we had witnessed. 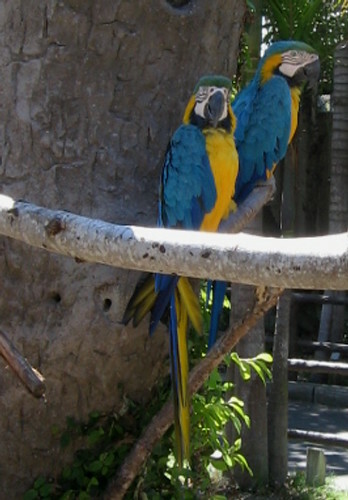 The Santa Barbara Zoo is a living part of our community, an ever-changing stage full of colorful characters - animal and human - who come together to revel in our shared time on this planet, to celebrate "the natural world and its living treasures". 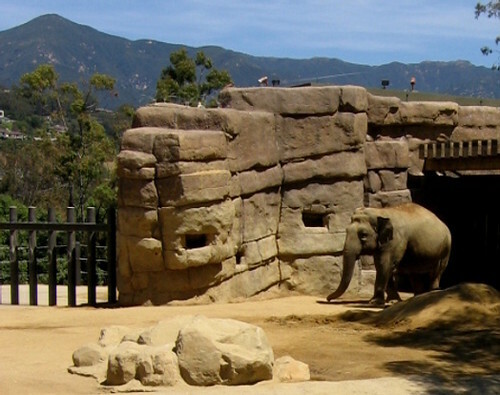 For more information about the zoo, go to their website: Santa Barbara Zoo. 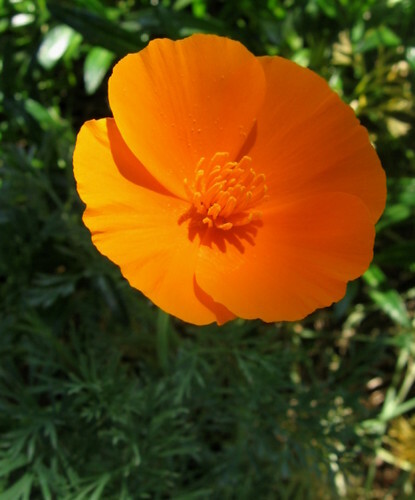 "...It is during the months of spring that this queen of California flowers holds her especial court....It is a true poppy, a member of the same drowsy family with the immemorial flower of sleep and the Shirleys of our garden. 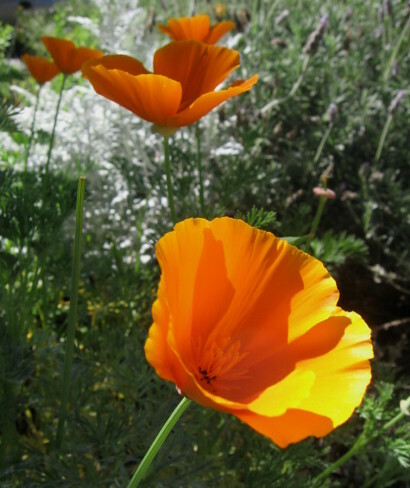 Our Spanish people have several names for it, as 'torosa' and 'toronja'....and the name it shares with other poppies, 'dormidera', the sleepy one, because of its habit of closing its petals at the approach of evening, as though dropping off to sleep..."